What Is Accident Life Insurance? Sep 19 • Finance • 544 Views • Comments Off on What Is Accident Life Insurance? An accidental life insurance policy, sometimes also known as Accidental Death and Dismemberment (AD&D) insurance, provides a benefit to you or your beneficiaries in the event that your dismemberment or death is the direct result of accidental causes. An accidental death policy or rider is similar, but does not cover dismemberment. How do I purchase accident life insurance? You may typically purchase an accidental life insurance policy on its own, along with dismemberment coverage, or purchase either accidental life coverage alone or together with accidental dismemberment coverage as a rider to your existing life insurance policy. What are the benefits and restrictions of an accident life insurance policy? An accidental life insurance policy may pay your beneficiaries up to twice your life insurance policy benefit in the event you die from an accidental death. 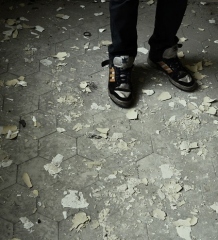 However, an accidental death policy offers very limited coverage based on specific circumstances. For instance, in order to receive the benefit from an accidental life insurance policy, your death must generally occur within a given time period after an accident – typically within a few months for the accident to be considered fatal and the cause of your death. Accidental life insurance policies generally include exclusions. Often an accidental death policy will not provide benefits if you die during surgery, as a result of a mental or physical illness, a drug overdose, and other causes. Also, many accidental life insurance policies do not cover death as a result of what the insurance carrier may consider risky behavior, such as skydiving or car racing. Do I need accident life insurance? Although you may choose to purchase this type of coverage, you may want to purchase it in addition to a more comprehensive life insurance policy. 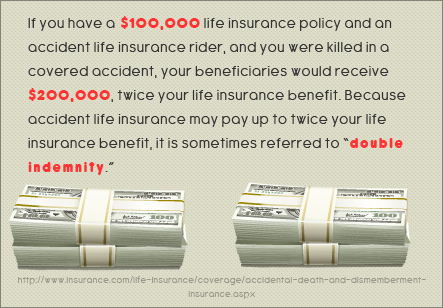 Accidental life insurance is generally inexpensive, but it also provides limited coverage and a limited benefit. In addition, if you are involved in a high-risk occupation, you may be quoted higher premiums for accidental life insurance because the insurance carrier may consider you more of a risk. You may also choose to purchase a life insurance policy with a larger benefit amount as an alternative to an accidental life insurance policy or rider. A general life insurance policy will generally not have as many restrictions as an accidental life insurance policy alone will. You may want to consider your needs and the likelihood you may need accidental life insurance coverage before purchasing a life insurance policy. Kathy Kara writes on life insurance issues at Best Life Insurance Deals. Am I Eligible For Renters Insurance?